A previous post mentioned that I was invited to be part of the Hampton by Hilton Ultimate Seekender Team. One of the unexpected pleasures of our stay was the terrific breakfast spreads offered at the Milpitas, California property (similar to those available at other Hampton by Hilton hotels). Most of the spacious lobby (dead space in many hotels) has been transformed into a warm, welcoming breakfast area with comfortable seating. The tables (and the continually replenished buffet station) are well maintained so you never sit down to someone else’s leftovers. Long tables are great when you’re traveling alone or with a group: A long table in the center of the room allows strangers to become fast friends. Two large flat-screen TVs at opposite sides of the room allow guests to tune into local and national news and weather. Depending on your mood, you can either go healthy or decadent. The expansive buffet counter offers a choice of white and whole grain breads, bagels and muffins, hot and hearty oatmeal, multiple cold cereals, fresh fruit and berries, yogurt and cheese omelets (with sausages and potatoes on the side). The make-your-own waffle machine is fun for kids (and adults). You fill a cup with batter from an automatic dispenser, pour the batter onto the waffle maker, and presto! Two minutes later you have a delicious waffle that you can top with maple or fruit syrups. For those who like to indulge in dessert for breakfast, there’s chocolate and caramel sauces and whipped cream toppings. No two people agree on how they like their morning Joe. After you’ve had your glass of OJ from the buffet, there’s a choice of fresh hot decaf, robust or regular coffee, tea or hot chocolate. Addicted to Coffee-Mate? In addition to milk, and half and half, you can add either French vanilla or regular Coffee-Mate to the brew from the perky dispensers. The free coffee and tea bar remains available to guests 24/7. Whether you are traveling with a tribe of girlfriends or a family with kids, there’s room for everyone at the breakfast table. There are plenty of highchairs as well as quiet spaces to read a newspaper or work. Happy kids make happy parents. 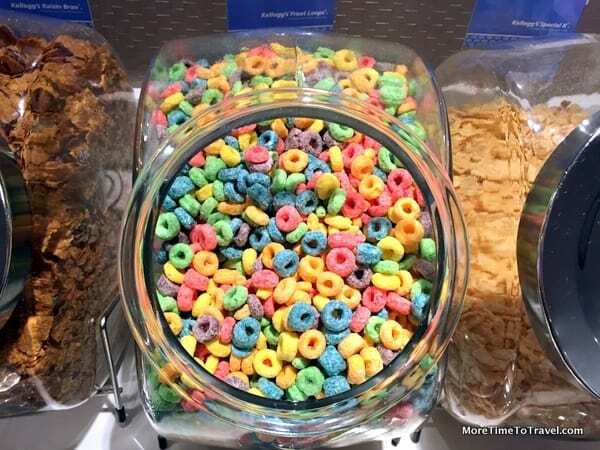 Kids will find the colorful scoop-yourself Fruit Loops irresistible (placed next to the more grownup Raisin Bran, sugared Mini-Wheats and Special K). They also love all the help-yourself/serve-yourself dispensers including the orange juice dispenser. If you’re the kind of Seekender who is tethered to electronics, you’ll be happy to learn that free Wi-Fi privileges extend to breakfast in the lobby where there is plenty of table space to work, read or relax. The business center (with a computer and printer) is also conveniently located in one corner of the area. By the way, if you’re headed out for sightseeing and there’s no time for breakfast, don’t forget to pick up one of the Hampton on the Run™ breakfast bags at the front desk so you’ll be able to stay hydrated and well-fed on the road or on your way back to the airport. Disclosure: As a member of the Ultimate Seekender team (the only empty nester Seekender), our weekend getaway to the Silicon Valley was sponsored by Hampton by Hilton but all opinions expressed in this post are our own. I love the “breakfast-to-go” idea. I have never seen that before and it’s brilliant!! It seems that they have thought of everything and everybody here! The breakfast was pretty amazing! When my kids were small they always raced to those waffle machines. Now, of course, they sleep right through the designated breakfast hours. Love the On the Run breakfast kits. When we were in Vietnam the plane from Hoi An left very early in the morning and all the hotels provided breakfast kits for their guests catching the plane. It was fun watching everyone open theirs at the airport. Some were very fancy, whilst ours was in a polystyrene take away container. Still an excellent idea.